Ryan Crotty and Rieko Ioane will start for the All Blacks but Sonny Bill Williams has been ruled out of Saturday's clash against South Africa due to tonsillitis. There are 10 new starters for a strong All Blacks side who are looking to extend their unbeaten record in the fourth-round Rugby Championship match. Crotty, who suffered a concussion after a head clash with team-mate Jack Goodhue in the opening match of the southern hemisphere competition against Australia, will slot back into his preferred inside centre role. Coach Steve Hansen has recalled Ioane to the left wing after he recovered from a hamstring injury. Williams was initially named on the bench following a horror run of injuries, but was ruled out on Thursday with tonsillitis after feeling ill all week. 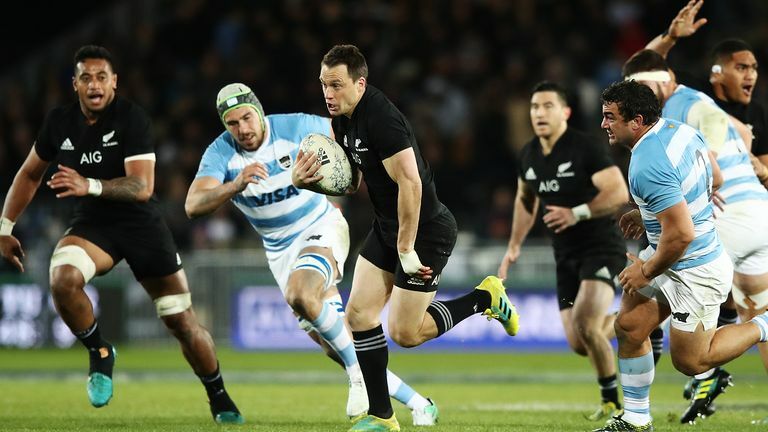 Hansen reinstated first-choice flankers Sam Cane and Liam Squire, while lock Sam Whitelock replaced the injured Brodie Retallick and Scott Barrett retained his spot in the second row. Jordie Barrett has returned to full-back with Ben Smith shifting to the right wing and with Ioane taking the number 11 jersey, Waisake Naholo drops out of the matchday squad. Patrick Tuipulotu comes onto the bench as lock cover for his first Test of 2018. Aaron Smith and Beauden Barrett will play in Hansen's preferred halfback combination. "We've had a good week's preparation here in the capital focusing on what we need to bring to the game through our skillsets, the intensity of our play and our energy," said Hansen after he named his side. Replacements: 16 Liam Coltman, 17 Tim Perry, 18 Ofa Tu'ungafasi, 19 Patrick Tuipulotu, 20 Ardie Savea,21 TJ Perenara, 22 Jack Goodhue, 23 Damian McKenzie.